Enchanter’s nightshade has tiny delicate white flowers and unassuming foliage that belies its creeping and persistent habit. It is occasionally found in gardens, but is seldom a serious weed problem unless it has been allowed to spread over a wide area. Enchanter’s nightshade, Circaea lutetiana, is a native plant common in woods or the borders of woodland, in shade or semi-shade. It thrives in moist, rich soils and can be a nuisance in gardens. At full height, enchanter’s nightshade can reach 60cm (2ft). Leaves are held opposite along the stems and basal leaves are usually heart-shaped. Flowering occurs from June to August. Small (4-8mm) white flowers appear from pink buds on slender upright spikes. This plant is a perennial with overwintering rhizomes. Spread is by means of stolons to form large colonies under suitable conditions. Enchanter’s nightshade usually favours loose soils rich in leaf litter, conditions in which it can be forked out with little difficulty, although it may be hard to remove all traces of the weed at a single attempt. 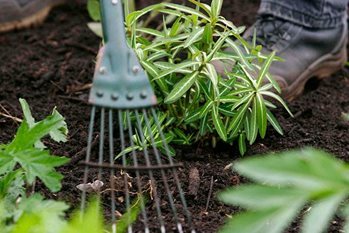 In areas where it is not so easy to fork out by hand, a heavy mulch of leaf litter will encourage the weed to root into the loose layer from which it can be more easily removed. Where the weed is established clear of garden plants, a glyphosate-based weedkiller (e.g. Roundup Fast Action, SBM Job Done General Purpose Weedkiller or Doff Glyphosate Weedkiller) can be applied as an overall spray. This is best done from mid-summer onwards, when the weed is coming into flower, or later, but before the foliage begins to die down in autumn. If garden plants such as primulas, ferns and other woodland plants are nearby it is safer to spot treat with a ready-to-use spray or gel application (Roundup Gel). The full effects of glyphosate on weeds can take three or four weeks to develop. As it is inactivated on contact with the soil, it can be used in areas where there are underlying tree or shrub roots nearby. Occasionally, enchanter’s nightshade may be encountered amongst established shrubs or under hedgerows in moist soils. In these situations SBM Job Done Tough Weedkiller (ready-to-use only), SBM Job Done Path Weedkiller (ready-to-use only) and Weedol Pathclear products containing glyphosate/diflufenican and can be applied once a season to natural surfaces where no plants are to be grown, and can also be applied under and around established woody trees and shrubs. This product kills off existing small green growth and prevents or checks developing growth. Check manufacturer’s recommendations before use to avoid damaging sensitive plants.